When it comes to discovery and adventure at home, one room stands apart as an enticing and delicious wonderland where your child can contribute and feel grown up. If the prospect of messy meal-making gives you pause, consider that cooking with you is among the best ways for your children to develop skills they’ll use for the rest of their lives. Tip: Choose fresh and healthy ingredients together at the market to involve your child in meal planning and make trying new foods even more tempting. LET’S EXPERIMENT: The kitchen is a wonderful science lab for children. By helping to prepare meals, kids learn to observe, measure, analyze, and make predictions. Cooking brings abstract concepts such as the role of temperature and properties of matter vividly to life as ingredients transform when broccoli steams, butter melts, and batters rise and bake. It also builds your child’s comprehension and reasoning skills. Tip: Kitchen equipment is way cool! Having kids set the timer and control the blast of the blender will go over big. HANDS-ON FUN: Whether they wash vegetables, pour, peel, chop, squeeze, mix or knead – there are many kid-appropriate, important jobs for little hands to do. Along the way, your child will build small muscle control, sharpen fine motor skills and develop hand/eye coordination. Be sure to point out all of the safety precautions you’re following as you cook together. Kids as young as 3 can begin learning knife skills using a child-safe knife. Tip: Give your child a dedicated space at the counter to emphasize her contribution and keep the mess contained. GET CREATIVE: – As an art form that involves all of the senses, cooking inspires kids’ curiosity, thinking and problem-solving capabilities. While creating his culinary masterpiece, your child is exploring sweet, salty and sour flavors, discovering a world of colors, textures, and aromas and creating a symphony of sound. Cooking also helps introduce your child to new cultures and traditions. Tip: Children often like to taste every ingredient as it’s being added. Be sure to explain that certain foods shouldn’t be eaten raw. IT ADDS UP: Cooking provides natural opportunities for your child to learn and apply math skills. As you follow a recipe together, your child is measuring water, counting eggs, learning about one-to-one correspondence and getting introduced to simple fractions. Tip: Point out that the same amount may look different when you change containers. Have your child prove that out by pouring ingredients into cups or bowls of different sizes. A LANGUAGE OF ITS OWN: Working side by side with you in the kitchen helps your child develop communication skills and builds a foundation for early literacy. 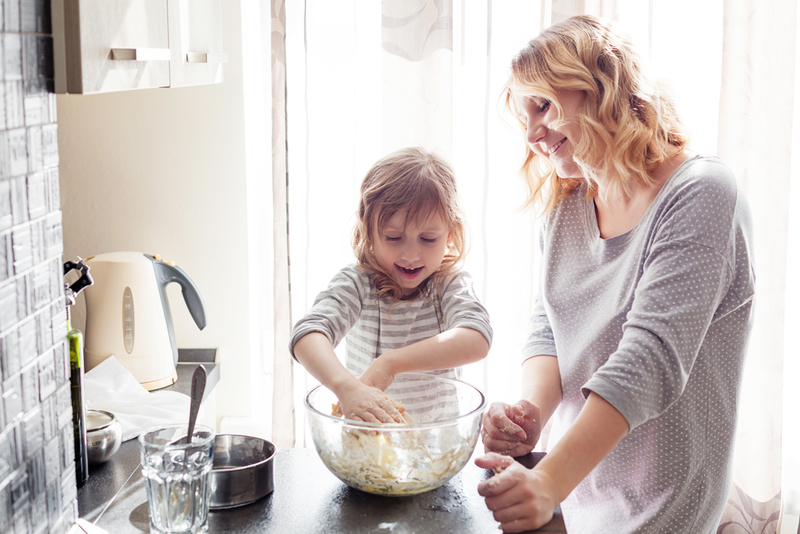 As you read a recipe aloud together, your child is learning to follow words from left to right and top to bottom, as well as distinguishing letters from numbers. Cooking is ripe with opportunities for kids to describe what they see and taste, and to learn new terminology as they blend, shred and slice. Tip: Use illustrated cookbooks and recipe cards to help your child match pictures to words, and encourage questions along the way. I MADE THIS! Helping out in the kitchen contributes to kids’ emotional development and self-assurance as they build confidence in their abilities. It also encourages independence as children learn to take responsibility while following directions and solving problems. Tip: Allow for extra time in the meal-making process. Provide guidance and support on specific tasks – if possible, resisting the temptation to step in and take over.